Hand made Wooden Wall Clock - size : 29cm diameter. 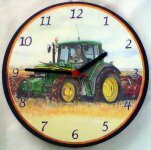 This full color wooden clock with the John Deere hard at work during the harvest will make a great gift for the John Deere enthusiast. Nothing runs like a deere. Each John Deere Clock will be securely packaged in a sealed box for posting.